A little fanart/experiment. I really wish Nintendo would make another 2D Metroid game. Oh man, what I would give for there to be a metroid game that looks this good. never played any of the 2d metroid titles, but WOW this is absolutely stunning. Thanks! You really should play them though, they're excellent. I want to someday. After playing Ori and the Blind Forest the original metroid franchise is looking quite appetizing. Did you actually do this all as Pixel art or did you paint it and apply some kind of filter to get that effect? It was actually a combination. It started out as a painting, but then I figured it would be awesome as pixelart, so I downscaled and started using the pencil tool as well as the brush tool. I also added some layer adjustments and a pixel dithering layer. That's awesome. So so good. Love the particle effects from the open door. Damn. A cool surreal forest area in one would be great. wow, just imagine a Metroid game looking this atmospheric. and fluid. So well done. I agree with your sentiment, I'd 1. love another 2D Metroid game and 2. I'd LOVE to see it in your style! Wow! I absolutely love this piece! It's so cool ! With these beautiful ligthnings, it makes me think to Rayman's beautiful games with this forest.
" 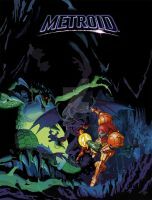 I really wish Nintendo would make another 2D Metroid game." yea... and _I_ wish you would do their concept art. SORRY MAN BUT I LOVE THIS! I wish I could do their concept art. Thanks! I would love a Metroid game that looked this luscious! How much E should I put in NEEEEEEEEEEEEEEE[...]EEEED to have a Metroid game with that ambiance ? Wow, an artstyle like this for a new metroid game would be sooo neat. Hell a remake of the original NES version in this style would be great.